It Ought To Be Illegal! The title of this post come from my days of retail gardening. A customer was talking to me either about a weeping cherry (the smaller tree on the left) or a magnolia) the larger on the right. Anyway, she had one of these “messy” trees planted too near a deck. She was speaking about it very disparagingly and said that it ought to be “illegal” to sell trees that made such a mess. 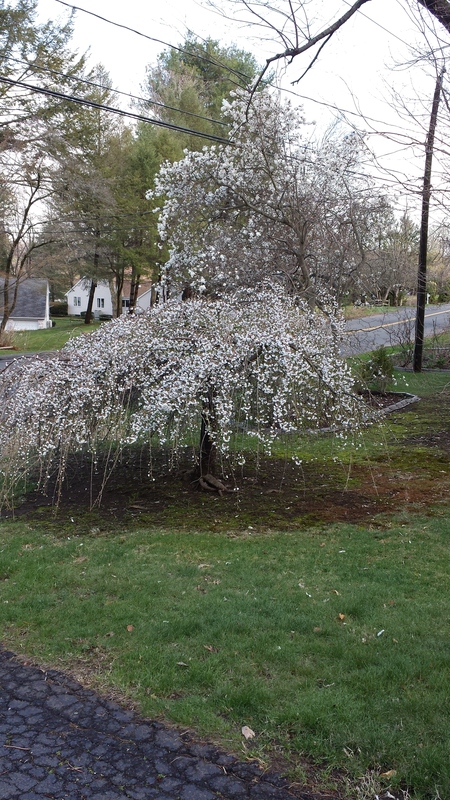 I’m not sure about you, but I’m certainly willing to put up with some “mess” for a display like this every spring. And anyway, don’t we have enough silly laws? yes we do have enough stupid and unjust laws. the responsibility of choosing plants is the customers responsibility if she doesn’t want a mess then cut it down and stop complaining. my trees and plants create a lot of mess sometimes, okay that is up to me to decide how much I am willing ot put up with not congress or some weird people who decide I need to be regulated or have my choices censored and approved. I agree. I have lots of “messy” plants. Think of impatiens and begonias–ugh. Do I not plants them any more because of the mess? Of course not! What about roses? They can be a disaster. That customer probably wouldn’t think of having something like that around either. Some people miss out on a lot of life that way. But “laws? !” That’s really going way too far! I can only hope she didn’t mean it! Thanks for reading & commenting, as always.